1. First of all, you can keep it in a nursery to warm milk. 2. Alternatively, you could use it store medicine that requires refrigeration. 3. 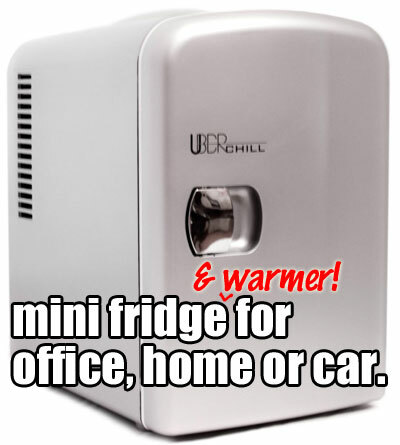 In addition, you can set up this mini fridge at a coffee station to chill creamer. 4. Plus, you can place it by your desk to refrigerate your lunch at the office. 5. Plug the Uber Chill into your vehicle with the 12V power cord and keep drinks and snacks cold on long road trips. 6. On the other hand, you can keep your breakfast warm while driving to work. 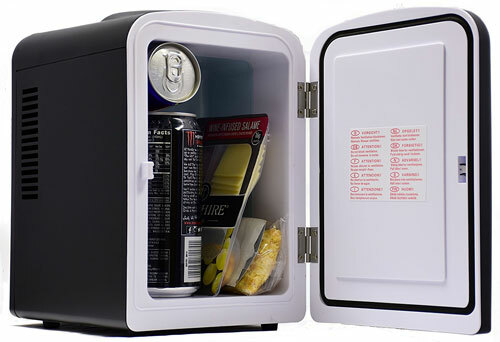 Below, you can check out a full review of this mini portable refrigerator. They measure how fast the unit heats and cools, plus how much energy it draws. You can hear how quietly the device operates as well. Compared to larger portable coolers, this compact unit takes up very little space. Therefore, you can conveniently fit it almost anywhere. In addition, it requires a minimal amount of energy to run (less than a traditional light bulb). Keep it Turned On: Think of this unit as a mini fridge VS a portable cooler. You can run it continuously without having to unplug it. Therefore, you can set it up permanently in your office, garage, nursery etc. and conveniently have a cooler/warmer ready when you need it. Organize Your Cooler: It does include a removable shelf, although many people find they don’t need it. It can, however, help you organize interior contents and make items easier to access. Door Stays Shut: The door also features a self-locking mechanism, which is key if you use your fridge in your vehicle. You don’t want to have to worry about the refrigerator door flying open when you drive over a bump in the road, right?